See the MSC check label? You can eat that fillet guilt-free. If you have meal points (or a friend who has meal points to mooch off of), you may have noticed that Wednesday was a special day for Cal Dining. All four dining halls — Crossroads, Unit 3, Foothill and Clark Kerr — had a “MSC Seafood Extravaganza” in celebration of Cal Dining’s MSC certification. If a fishery is successfully certified then they can label their products with the MSC sustainability label. These labels allow consumers to identify and support responsible fisheries. UC Berkeley is the first public university in the United States to be MSC-certified. Kerry Coughlin, the MSC regional director for the Americas, stated that most seafood suppliers for Cal Dining are MSC-certified and Cal Dining is aiming to have all of its seafood come from certified fisheries soon. For now though, if you see a menu item that has “MSC” in its name (i.e. 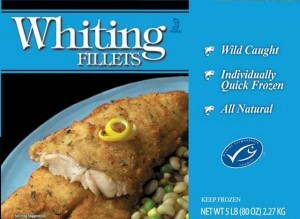 “MSC fish sticks”), it means that you can eat without feeling guilty that you are indirectly destroying the ecosystem. The Daily Clog visited Crossroads during the extravaganza and was welcomed by an array of blue balloons and a banner that proclaimed, “Cal Dining now offers MSC-certified seafood.” In celebration, Crossroads offered three special dishes: MSC fish sandwichs, MSC fish and chips and MSC Asian shrimp nachos. 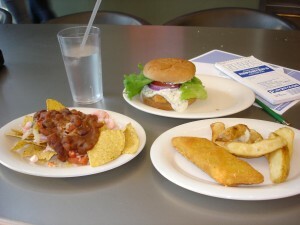 Pictured from left to right: shrimp nachoes, fish sandwich and fish and chips. Tartar sauce unfortunately not present (yet). All three options were pretty tasty, although we were a little confused as to what was “Asian” at all about the nachos. As far as we know, the nachos consisted of tomatoes, lettuce, tortilla chips, refried beans and shrimp. Maybe the shrimp was of an Asian persuasion? 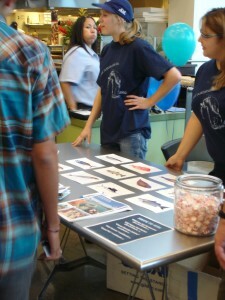 There was also a table set up that displayed various pictures of fish. If diners could correctly guess the species of three fish, they won a free T-shirt. They would also get their Cal 1 Card swiped to enter a raffle where they could win a $100 gift certificate for Sea Salt Restaurant or Tokyo Fish Market, as well as various cookbooks. Of course, we got ourselves a free shirt with the lucky guess of swordfish, anchovies and mackerel. By around 6:30 p.m., all the T-shirts were gone, so unfortunately the late eaters missed out. A Cal Dining employee repping the "free stuff" table. Overall, the food was good, the free stuff was good, and the cause was good. A+ for Cal Dining! Image sources: Walmart Stores under Creative Commons (header). Deborah Lee, Daily Cal (all others).